For removing and tightening of nuts. Used for opening and closing the grating. I am looking for a short handle and bought this item. I think it is very easy to use. This review is about item#10385523. Use the glasses wrench, the monkey, the hexagonal wrench to exchange this blade of the round. Hexagonal wrench is hard to turn, it is hard to turn, unless we remove eyeglasses and wrench one at a time it is difficult to turn around, inserting the socket into the impact rolls off the work table and removes "ah ~ ~ mo]. Working patterns, dust-clad circular saws and regular circular saw blades are often changed frequently so they can always be put on the work bench and will not fall off, or even if it falls, it will not scratch the floor. I was looking for a cheapest alternative to a tool box. If Makita, Ryobi's dust collection, circular saw, anything matched by number 10. Even if I lock it, the length of the part to turn can be turned easily and easily. It seems that surface treatment is good and lasts long, but it is better if there is something a bit cheaper. This review is about item#10385496. I usually use a longer tool, but in some cases a long one is purchased for use when it is in the way to be used, precision is inferior to a cheap and expensive manufacturer. This review is about item#10385514. I bought 10 mm, but it is very nice feeling because it's easy to handle and not get in the way as it fits in my hand. In a place that can not be tightened with eyeglasses, It is good work efficiency to purposely eliminate the process of attaching extensions and 10 mm boxes to the handlebar. Cleaning up is inevitably simplified inevitably. Although I do not know the durability, I do not feel it is so soft, I think. I did not care about the length so much, so I bought it would be convenient to work with. When it arrives it is surprisingly short, and when is this used? I thought. It was shopping thinking that it is important to check and purchase. This review is about item#10385471. I want a device such as length or grip so that a force can be applied to the handle. This review is about item#10385584. The price was also cheap, I bought four in all. Although it is practically satisfied, there are rough textures such as whether the surface treatment is complicated, and things that do not feel well are mixed. In order to distinguish the size, it is convenient to be able to distinguish by color by winding a vinyl tape at the base. 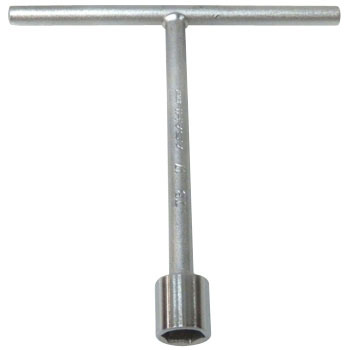 I purchased it as a backup tool for piping tools. It is very handy in a narrow place.